Ahh, the Florida springs. Crystal blue gems that dot the sub-tropical paradise that is Florida. We’ve been to over 30 springs and Weeki Wachee definitely tops our list. 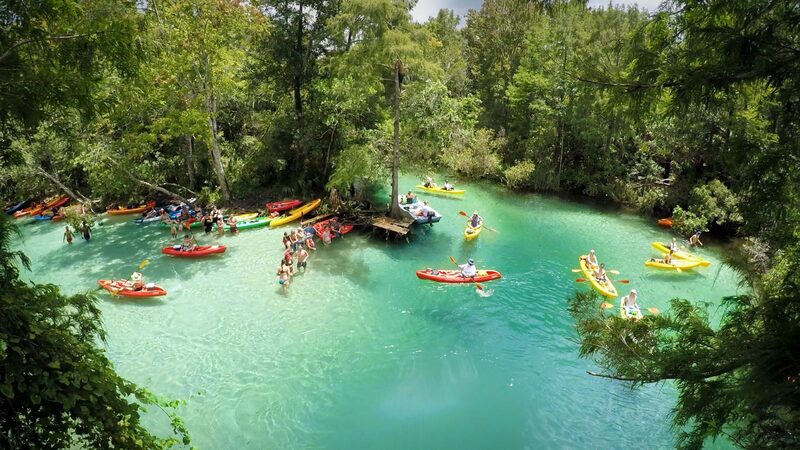 There’s so much to do here, from kayaking to a waterpark to mermaid shows (yes, that’s a thing), Weeki Wachee is the perfect destination for nature lovers and families alike. Weeki Wachee Springs is located on the gulf coast of Florida, about an hour and a half from Orlando and Gainesville, and about an hour north of Tampa. If you are visiting Florida and are in one of these areas, it’s definitely worth a day trip. These prices include the life jacket and shuttle back. Keep in mind to leave early, as they ask you t finish the 5 mile run and reach Rogers Park (where they will pick you up) by 4:30p.m., or you will incur a $50/hour late fee. Brown Water Snake at Week Wachee Springs. 2. Buccaneer Bay Waterpark. Entry into the waterpark is included with the purchase of your ticket into the park. One unique feature of this waterpark is that the slides feed directly into the spring! It also has a nice beach so parents, kick off those shoes and relax while your kids play in the spring! 3. River Boat Tours. Another activity included with your ticket is a river boat tour. If kayaking isn’t your thing, relax and enjoy this cruise down the river with your family. These rides last about 25 minutes and are a great way to see part of the river and still have time for all of the other activities that await you inside the park. 4. Wildlife Shows. Also included with your ticket are wildlife shows. Learn about some of Florida’s native wildlife, including alligators, snakes, and exotic birds. Show times are at 10am, 12pm, and 2:15pm. Being Florida natives who see alligators on a daily basis we decided not to go view the show, but we did talk to a group of tourists who went and saw it and they loved it. If you aren’t from Florida then we recommend going to check this out, especially since it’s included in your ticket price. If you have children this will be a highlight of their trip to Florida. Weeki Wachee is home to the Weeki Wachee Mermaids, and they have two showings that run every day year round: The Little Mermaid and Fish Tails. Even if you aren’t going with kids we recommend seeing one of their mermaid shows, as it is a unique entertainment experience unavailable anywhere else. Bonus: Eat at Upper Deck. Although there is food in the park, we recommend going to Upper Deck. If you are kayaking, it is right by Rogers Park, looking over the river. You can park your kayak right outside of it and dine in. If you didn’t kayak, it’s only 5 minutes away from the park. They have great cocktails and seafood at a pretty decent price!